At nicofarre in Roppongi, Minato city, Tokyo on November 28, Yukie Nakama (center), who starred in "The Tempest 3D," promoted the film, saying, "I would like the audience to enjoy the stunning 3D images," with co-stars, Shosuke Tanihara (right) and Saki Takaoka. On November 28, a press conference was held at nicofarre in Roppongi, Tokyo regarding the production of the 3D movie, “The Tempest 3D” which is based on a novel set in the Ryukyu Kingdom in the 19th century and stars Okinawan actress Yukie Nakama. “The Tempest 3D” is based on the novel written by Okinawan novelist Eiichi Ikegami which has been adapted both for the stage and for a television drama series. 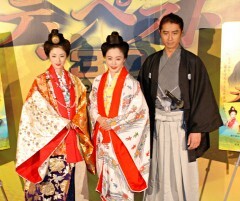 In addition to Nakama, actor Shosuke Tanihara, who plays the role of feudal retainer of the Satsuma Domain Masahiro Asakura, who falls in love with Mazuru, and actress Saki Takaoka, who plays Kikoeookimi, a character who becomes hostile towards Neion, spoke at the press conference. When asked what he and Asakura have in common, Tanihara’s response of, “I and Asakura both like Yukie Nakama and Okinawa,” was warmly received.